a lifestyle blog about the persuit of bringing beauty to a house full of men. For the past 5 years we’ve gone out for Thanksgiving dinner. When we stayed home I was the one sweatin’ in the kitchen while the Mr. would entertain the boys for 4 hours. Then dinner was over in 15 minutes and I had a 2 hour mess to clean up. I sound like am complaining but I really am thankful to have a wonderful family to serve. This year we’re staying at home because we have a 1 year old gremlin who I wouldn’t dare set foot in a restaurant with. Time to dust of my Thanksgiving recipes and get to work. (except for my 8 year old who thinks I’m trying to poison him). 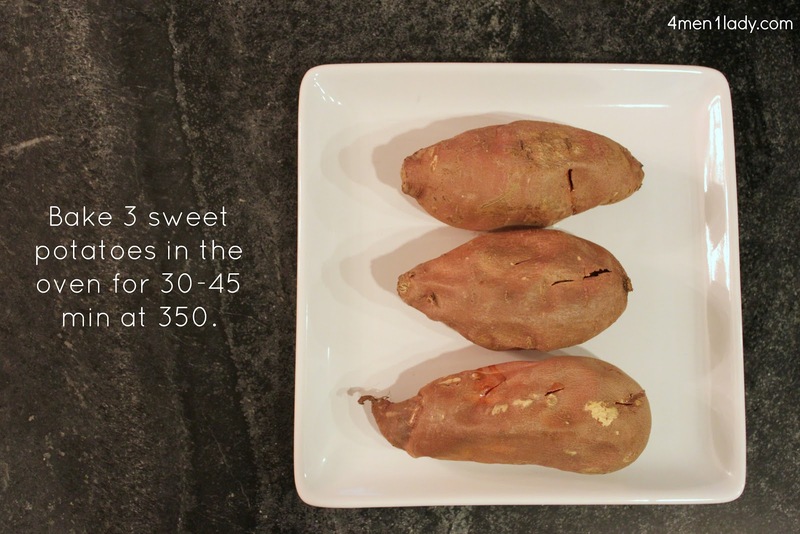 Start with three-four sweet potatoes. 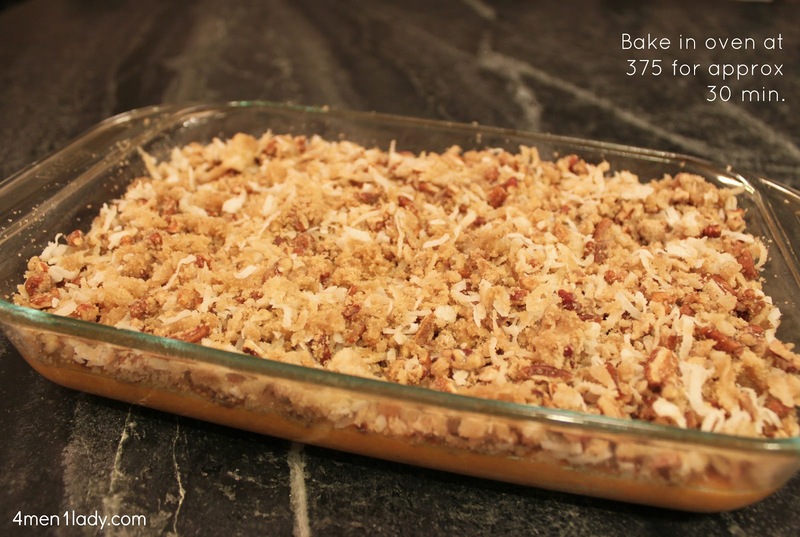 I usually bake on a baking pan at 350 for about 30-45 min until you can poke a knife through easily. Take out of the oven and let cool. 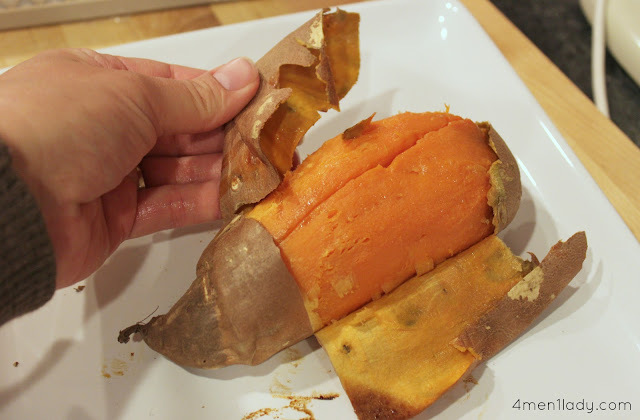 If you haven’t worked with sweet potatoes before you can easily remove the skin just by slicing it down the middle and peeling the skin right off. 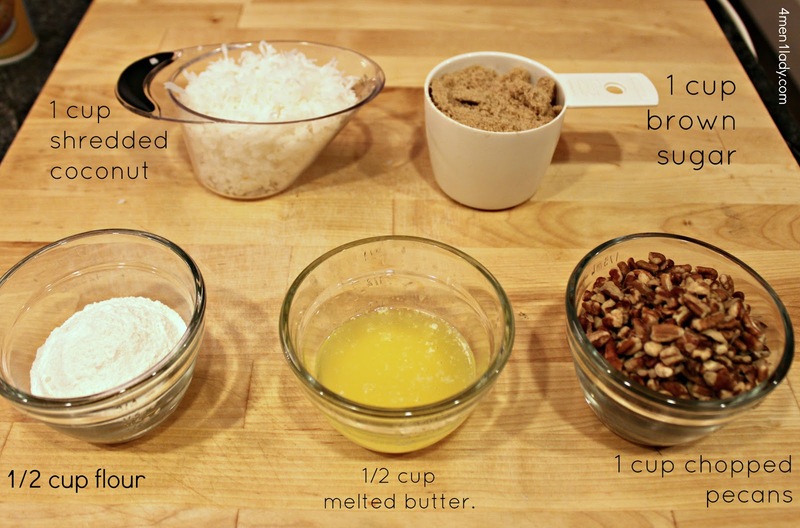 Mix up the following ingredients in a bowl (I’ll have the recipe and directions at the end). Put in a greased baking dish. For the topping mix the following ingredients in a bowl. 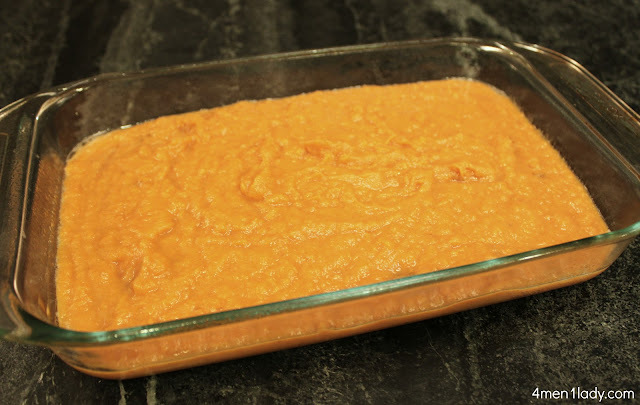 Put topping on sweet potato mixture. Bake at 375 for approx 30 min. Try it out this Thanksgiving…I promise you there will be none left over! So good it could easily be dessert. 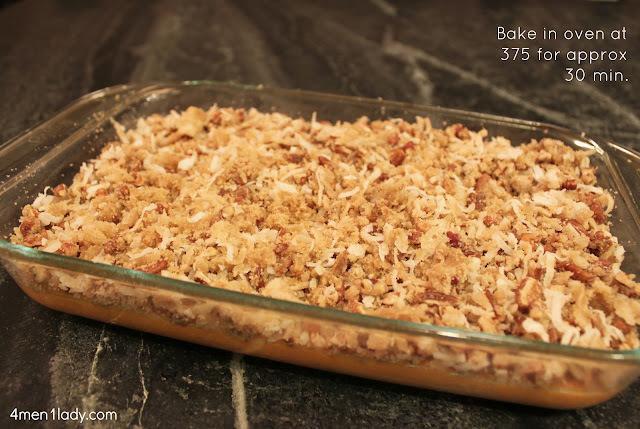 Mix all ingredients in a bowl and put in a baking dish that has been greased. 1 cup shredded coconut (I buy mine in a bag at the store). 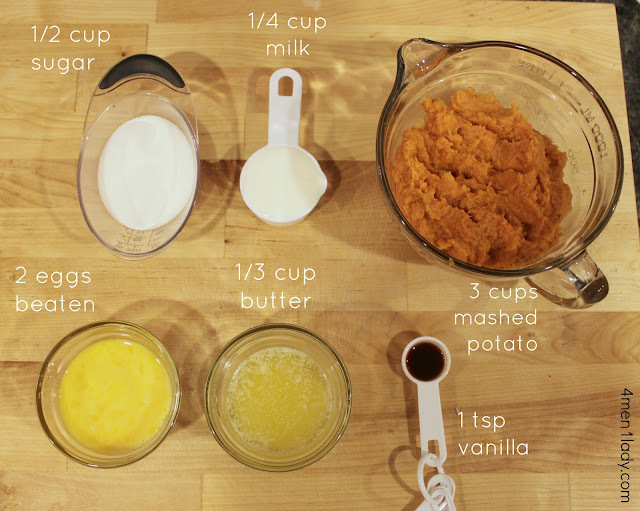 1 cup brown sugar (I only use about 2/3 – 3/4 cup). Mix all ingredients together in a bowl and top upon sweet potato mixture. « How to dry shoes in the dryer + for sale. Have you considered starting a Foodie Friday linky party? Recipe sounds like something my family would love. Sounds delicious! Does it re-heat well for leftovers? They re-heat really well. 35 seconds in the microwave and viola (in fact, I’m eating them now). Just add cool whip and I’m in for dessert! Looks delish! I think I’m going to have to try this one. I have never had sweet potatoe pie, just plain old sweet potatoes! This looks so good! Yummmmm! Must try this!! Thanks for inspiring with this yummy dish. I hate nuts but this looks insanely delicious. Wonder how they’d turn out nutless?? 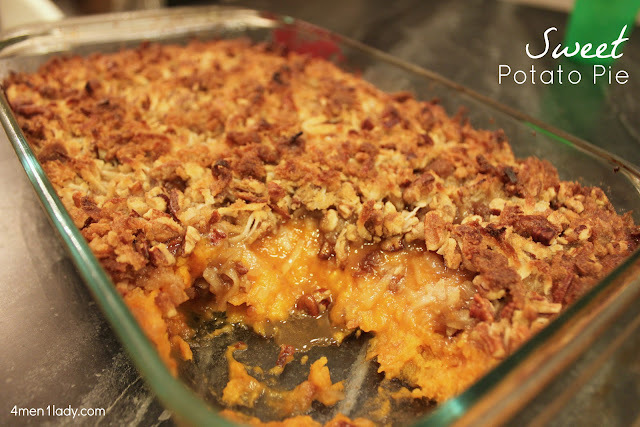 I saw this post and it made me want to try this instead of our usual go-to sweet potato pie recipe. Looking at both recipes to make sure I had all the ingredients I discovered they were EXACTLY the same except for the coconut in the topping so I put 1/2 c. coconut in the toppping on one side to do a sort of taste test. The coconut was a hit. The verdict – coconut from now on. Thanks for upgrading a family favorite!